We are really excited to be participating in this year's Hamptons Wedding Affair at Brecknock Hall sponsored by WellWed Magazine. 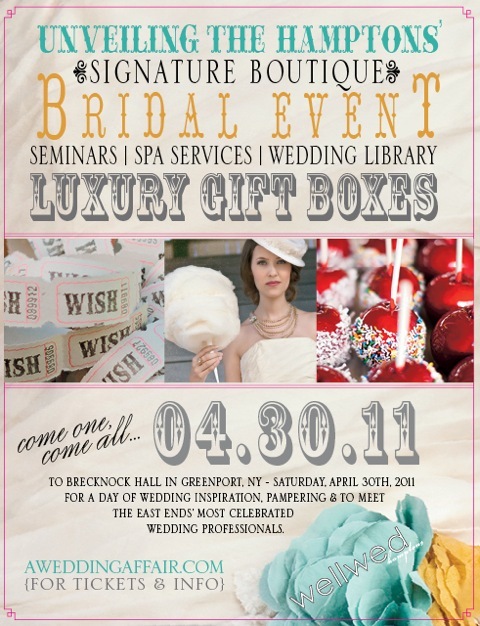 If you are a Hamptons bride, this is the event of the year you don't want to miss. Besides the many items featured in the silent auction, you'll get a gift box of goodies, see the latest gown trends fashion show style, get priceless wedding advice and we can't forget about the cocktails. Tickets are $40 per couple / $25 per person. Check out www.aweddingaffair.com for details. We will be giving away a free engagement session to one lucky couple at our table, so come say hello this Saturday (April 30th).